The political climate had already changed when Hungarian deputy minister of foreign affairs Levente Magyar arrived in Washington DC last December for two days of negotiations. Magyar could have expected a positive welcome at the State Department, but he had to face the reality that his U.S. counterparts were frustrated and critical of Hungary again. Even though the U.S.-Hungarian relations finally started to warm up last year. Details of the conversation between Mitchell and Magyar are included in a Hungarian diplomatic cable obtained by Direkt36. The cable was sent to Budapest by the Hungarian Ambassador to Washington DC, Laszlo Szabo. This document gives insight into Hungarian-American relations and shows how US diplomacy is trying to put pressure on Hungary’s government on issues important to Washington. In the meantime, Orban’s government is trying to balance its relationship between its ally, the United States, and Russia. After meeting with Mitchell, Levente Magyar went on to have talks with other senior State Department officials, and many of them repeated the same message: U.S. foreign policy – breaking with the Obama administration’s practice – refrains from criticizing the Hungarian government on domestic politics and ideological issues, but in exchange expects the Hungarians to help the U.S. in matters that are important to them. The diplomatic cable revealed that the Central European University (CEU) was no longer among the top priorities of the US government at the end of last year. However, the strengthening of the military cooperation and the expansion of U.S. energy exports came to the forefront. According to the document, the Americans are frustrated that although they have changed their attitude towards Orban’s government, they feel that the Hungarian side does not do enough in return. The Wall Street Journal and Atlatszo wrote on Sunday that Prime Minister Viktor Orban had recently told American diplomats that “he wants his country to be neutral, like Austria”. On Tuesday, Orban reacted by saying this is “fake news”, but according to the document obtained by Direkt36, the alleged statement – which, however, was phrased in a milder and conditional form – was even discussed at a higher diplomatic level. According to the diplomatic cable, Wess Mitchell also raised the issue that Orban had mentioned Austria and neutrality to the U.S. ambassador to Budapest. The document does not reveal if and how Levente Magyar reacted. Citing family reasons, Mitchell resigned on January 4, more than two weeks after his meeting with Levente Magyar. There is no information indicating that his resignation is in any way connected to Hungarian affairs. Previously, many in Hungary’s government have credited and praised Mitchell with being the driving force behind closer U.S.-Hungarian relations. Orbán’s government has lost probably one of its most important and most patient partners inside the Trump administration. We requested a comment on the diplomatic cable’s statements from Hungary’s Ministry of Foreign Affairs and Trade (KKM) as well as the Prime Minister’s spokesman, but received no substantial reply. A State Department official said that they decline to comment on private meetings. After his confirmation in the autumn of 2017, Wess Mitchell, Assistant Secretary of State for European and Eurasian Affairs, directed a spectacular turnaround in U.S. policy towards Hungary. The previous Obama administration openly criticized Viktor Orban’s government in matters of rule of law, human rights, anti-Semitism, media freedom and corruption. Bilateral meetings on a ministerial (Secretary of State) level between the two countries ceased after 2012. Representatives of the Hungarian government have repeatedly blamed Mitchell’s predecessor, Victoria Nuland, for the deterioration of the relationship. Hungarian pro-government daily Magyar Idok even labelled Nuland as a “Soros’s accomplice” and “Hungary’s American grave-digger”. Mitchell, on the other hand, had a completely different approach towards Hungary. According to the diplomatic cable, he told Levente Magyar that he “never agreed with his predecessor, Victoria Nuland, on her policy towards Hungary,” because “allies should be treated as allies,” he said. Mitchell also spoke about the fact that he is not the only one, there are others working on “a positive U.S. policy towards Hungary” too. There have been multiple signs of a positive change in direction for the Hungarian government over the past year. First, a program that was launched by Obama-era U.S. diplomats in the autumn of 2017 was shut down. This was a $700,000 funding opportunity by the State Department to support independent media in Hungary. However, it was cancelled shortly after Mitchell took office, hence the money was never distributed. The improvement in the bilateral relationship was also signalled by a meeting between Hungarian minister of foreign affairs Peter Szijjarto and U.S. Secretary of State Mike Pompeo in Washington in the spring of 2018. Another sign of the new direction for U.S.-Hungarian relations were the remarks of David Cornstein, the new U.S. Ambassador to Hungary. Cornstein arrived in Budapest in the summer of 2018 and named four top U.S. priorities in Hungary, three of which were related to the enforcement of American geopolitical interests. Keeping CEU in Hungary was the only issue that is related to the protection of fundamental rights. When it turned out that CEU was definitely moving Cornstein simply described the problem as “a debate between two people [Orban and Soros]”. Cornstein also previously stated that he is not aware of any violation of civil liberties in Hungary. According to Mitchell’s earlier speech there is an idea that the Obama administration’s foreign policy had neglected and thereby tossed Hungary and other countries in the region into the arms of Russia (and partly China). In contrast, according to the State Department’s current leadership, reducing Eastern influence over Hungary and other regional countries in the spheres of defense, security and energy became a priority so that these countries would support U.S. geopolitical interests instead. Therefore, in return, issues such as the decline of the rule of law and civil liberties must be let go. “outlined a more negative situation and asked multiple provocative questions”. According to the summary of the diplomatic cable, Levente Magyar received a “more negative, coordinated message on the political level (…). There is increasing pressure on the U.S. administration due to its alliance focused policy towards Hungary, while results on the Hungarian side are lacking”. “the heightened expectations and impatience towards Hungary”. The State Department “is taking a serious political risk and is attacked for its policy shift towards the Hungarian government. On the Hungarian side, there is no progress on priority issues, and the Lyubishin case is also a failure. They are forced to defend Hungary not only against Democrats but also against Republicans. What can they say when they are asked about the results” Pompeo’s senior policy advisor asked Levente Magyar. In the document obtained by Direkt36, CEU’s moving to Vienna only comes up briefly. American diplomats mostly referred to the university’s case as a further burden, one that forces the State Department to defend itself against criticism coming from Congress. There is no mention in the diplomatic cable of any U.S. criticism over rule of law, media freedom or corruption issues in Hungary. U.S.-Hungarian relations were strained by a story uncovered by Direkt36 as well as by the Hungarian government’s response to it. This story involved the extradition case of two Russian arms dealers who were set up and apprehended by U.S. and Hungarian law enforcement in a joint operation. However, in spite of the U.S.-Hungarian cooperation, the Hungarian state eventually decided against extraditing them to the United States (which carried out the investigation) and instead turned them over to Russia. Following the publication of Direkt36’s article on the Russian arms dealers, the State Department – which refused to comment on our original request – issued a statement that criticized the Hungarian government. State Department spokesperson Heather Nauert said that “this decision raises questions about Hungary’s commitment to law enforcement cooperation. This decision is not consistent with our law enforcement partnership, undercuts the work that our agencies had done together to build this case, and will make citizens in the United States, Hungary, and the world less safe”. In response, Hungary’s government spokesman Zoltan Kovacs accused the United States of failing to comply with Hungarian extradition requests as well: “In the last five years, Hungary has made extradition requests to the United States nine times, out of which US authorities have rejected eight cases,” claimed Kovacs. A source with information on the above-mentioned U.S.-Hungarian extradition cases, who spoke on the condition of anonymity, told Direkt36 that the majority of the eight unsuccessful cases mentioned by Kovacs were due to the Hungarian authorities’ failure to file the necessary documents for the extradition requests. The source claims the Hungarian authorities did not supplement their requests, not even after the U.S. had asked them to do so. In one case, Kovacs referred to a man who was not in the United States but in Canada. Kovacs did not respond to Direkt36’s question whether he still maintains his claims. Issues where Hungary have gained over the U.S. In addition to problematic issues, positive ones were also raised during Magyar’s negotiations. American diplomats have repeatedly highlighted the similarity between the policies of the Trump administration and the Orban government. They also praised Hungary’s participation in the Middle East reconstruction process and Hungary’s steps taken for persecuted Christians. Mitchell also thanked Hungary for “stepping up for the U.S. decision on Israel and Jerusalem, not only within the EU, but also in the United Nations. He asked when are we going to relocate our embassy to Jerusalem,” the cable says. David Hale, the Under Secretary of State for Political Affairs, urged Magyar on the same issue. According to Levente Magyar, Hungary does not want to be the first among EU countries to relocate its embassy, but if for example Italy, Romania or the Czech Republic would take this step, he does not rule out that Budapest would follow their lead. Sandra Oudkirk, who is responsible for energy diplomacy at the State Department, thanked the Hungarian energy company Mol for stopping the import of Iranian oil. A senior official at Hungary’s Ministry of Foreign Affairs and Trade also listed these issues as positive examples of U.S.-Hungarian cooperation to Direkt36. According to the source, Hungary is “one of the most important European supporters of US foreign policy in the United Nations”, for which the rejection of the UN’s Global Compact for Migration is one example, moreover, “we vetoed multiple EU resolutions trying to condemn U.S. foreign policy”. In recent years, U.S. diplomacy has repeatedly criticized the Hungarian government for its position on Ukraine. Due to Ukraine’s new education law, which is detrimental to the Hungarian minority in Transcarpathia, Orban’s government started to block high level Ukraine-NATO talks in autumn 2017. The situation has somewhat changed by now, the diplomatic cable reveals, as the U.S. is now siding more with Hungary on this topic. “In the case of Ukraine, the American side now agrees with the Hungarian position regarding Ukraine’s nationalist attitude and the dangerous precedent its education law could set,” the document claims. Mitchell admitted that “Hungarian objections over Ukraine’s education law concerning minorities are legitimate, and the U.S. is constantly raising this to the Ukrainian side.” Mitchell said that he is hoping that the Ukrainian government will concede soon. A senior official from the Hungarian Ministry of Foreign Affairs and Trade also told Direkt36 that in recent months, Ukrainians seemed more constructive in their negotiations with foreign minister Peter Szijjarto. However, Hungarian and U.S. diplomacy is very far from complete agreement over the status of Ukraine. Mitchell complained to Magyar that Viktor Orban had spoken about Ukraine as a “buffer state” in his speech in Baile Tusnad (Tusnadfurdo). According to Mitchell, he believes that it is also in Hungary’s “fundamental interest” that Ukraine becomes a part of the West, and that Ukraine could be a case study that “a small nation-state can establish political independence against Russia”. The Hungarian diplomatic cable’s assessment is that the U.S. Senate sees everything through the lens of Russian relations while “the Democratic majority in the House of Representatives is only expected to raise pressure on the State Department from January”. The cable concludes that the State Department is still able to counter criticism over the CEU and Lyubishin cases coming from Congress and the media, but “we have to make progress on key issues”. Mitchell and his colleagues told Magyar what these topics are. They urged the Hungarian government to cooperate in at least two energy projects (the LNG terminal in Croatia capable of receiving liquefied natural gas from the U.S. and the development of the Romanian-Hungarian gas pipeline), and in the issue of the defense cooperation agreement (DCA). “came back from Hungary frustrated because our country has changed its position on Krk several times”. The Krk in question is an island in Croatia where a terminal for receiving liquefied natural gas from the U.S. is under construction. Mitchell said that Americans were disappointed with how Prime Minister Viktor Orban talked about the price of American gas being 20 percent more expensive than the market price. The U.S. position is that purchasing gas is a strategic decision, and it is not just about the price. Mitchell “subtly expressed doubts” about Hungary’s commitment to energy diversification, according to the cable. In his view, the Hungarian government is discussing this issue with the United States only because it helps them “establish a better negotiating position against Putin” while bargaining a gas deal with Russia. Levente Magyar rejected the criticism by saying that Hungarians were both interested in energy diversification and in establishing a better negotiating position. Evidence for the previous is that Hungary constructed its pipelines to Romania and Croatia, from which direction gas from non-Russian sources can be imported. In his meeting with undersecretary David Hale, Magyar refused Hale’s request that the Hungarian government be more committed in its support for the Krk LNG project. Magyar said that “in the case of energy diversification, we have done everything but we will not make an economically unviable commitment”. In addition to the expansion of U.S. energy exports, there is another issue in which, according to the diplomatic cable, Budapest and Washington are unable to compromise – which really frustrates the latter. The United States wants to sign a so-called Defense Cooperation Agreement (DCA) with countries in the region, including Hungary. This agreement sets out the rules for how American soldiers can operate in the territory of their allies. The DCA is important to the U.S. because they feel that, despite the promised increase in defense spending, European allies will not contribute substantially to the security of the European continent in the foreseeable future, a Hungarian expert with knowledge of the American position told Direkt36. Hence the US at least wants to ensure the presence, as well as the efficient and fast movement of its own military infrastructure. The two countries started talks on the DCA in 2017, but they have not yet reached a compromise. For example, there is a dispute whether the United States or Hungary should have jurisdiction over U.S. soldiers who violate laws in Hungary. According to the diplomatic cable, the most significant debate is over the so-called general mandate. This means that once the DCA is signed and approved, the U.S. would be free to move its troops in the territory of Hungary. Orban’s government does not want to accept this, citing the country’s sovereignty. Hungary would require a parliamentary vote each time to authorize further movement of troops, vehicles or equipment. Levente Magyar also explained to Wess Mitchell that “the general mandate for the movement of soldiers conflicts with the Fundamental Law” of Hungary, according to the document. Mitchell replied that he had studied the relevant part of the Hungarian constitution, and concluded that “it is only a matter of the Hungarian side’s political will to interpret the relevant point of the constitution in a favourable way in order to reach an agreement”. According to Mitchell, what Hungarians are asking for is without precedent. Magyar warned “if there is no shift in position, we will not conclude the agreement”. Levente Magyar responded that “we are open to signing the agreement and we are as flexible as we can be”. 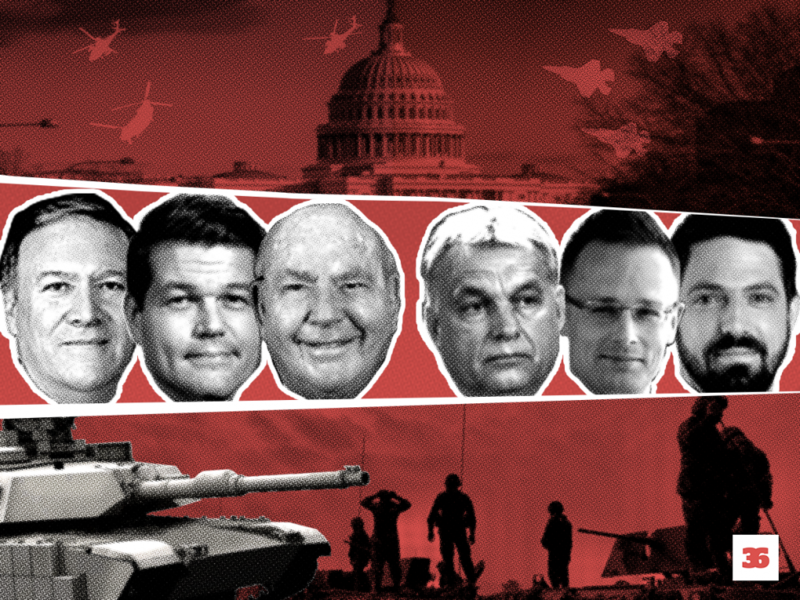 The Hungarian government has only raised legal objections throughout the negotiations, but the U.S. side suspects some other reasons in the background. According to a source of indirect information about the negotiations, the U.S. government assumes that fear of Russia’s potential reaction to the agreement is the real reason behind the Hungarian government’s reluctance. If there is such a Hungarian concern, Levente Magyar did not mention it during his talks in Washington, moreover, he said it was desirable that the United States deter Russia by military force. “Deputy minister (Magyar) referred to Poland and the Baltic states and drew attention to the fear of a concrete Russian threat, so U.S. military presence is a key issue for them,” it says in the document. Magyar also added that the Orban government wants to sign the DCA agreement, and suggested that progress could be made on this issue in February. A senior Hungarian foreign ministry official offered his view on the DCA discussions talking on the condition of anonymity. The official said that, in his opinion, officials do not understand in Washington that, after fifty years of Russian occupation and the 1956 military intervention, even a partial surrender of sovereignty triggers certain emotions. “I have no problems with the Americans, they are very nice, but there are limits to everything,” he said. Meanwhile, the U.S. is also trying to encourage Hungary with money to sign the DCA. Congress has previously approved a $55 million (about 15 billion Hungarian forints) contribution to the development of Hungarian military infrastructure. This initiative is formally independent of the DCA, but American diplomacy has made it clear that a country with no DCA signed is not getting paid. Orban called it a false report aimed at creating confusion. However, there are several signs that the statement on neutrality has been expressed in some form. Direkt36 was informed by two sources on condition of anonymity that Orban spoke about this when he visited the U.S Embassy on December 6 last year after the death of former U.S. president George H. W. Bush. Orban went there to write in a book of condolences, and a roughly half an hour conversation took place between him and U.S. ambassador Cornstein. “according to Ambassador David Cornstein, Prime Minister Viktor Orban explained to him that Hungary might take a more neutral position similar to Austria on the issue of soldiers”. Mitchell added that “if it is true, please report it immediately”. In this document, Orban’s statement is not phrased in a clear-cut way but it is in a conditional mode (“might take a more neutral position similar to Austria “), so it is also unclear how serious this intention of his is. The importance of the DCA was also signalled by U.S. Secretary of State Mike Pompeo calling Viktor Orban on January 22 and discussing the significance of “strengthening the U.S.-Hungary strategic relationship, including bilateral defense ties”. The diplomatic cable mentions that Wess Mitchell and Peter Szijjarto are expected to close the deal at their next meeting in February. Although Mitchell resigned on January 4, he will remain in office until mid-February. Direkt36 was informed by Hungarian foreign ministry sources that he will meet with Szijjarto to finalize the agreement in Washington on February 6. Mitchell is expected to be accompanied by ambassador Cornstein, the U.S. chief negotiator for the DCA, and a representative of the Pentagon at this meeting. The Hungarian foreign minister will also talk about the DCA at the White House with John Bolton, President Trump’s National Security Advisor prior to the start of his meeting with Mitchell.